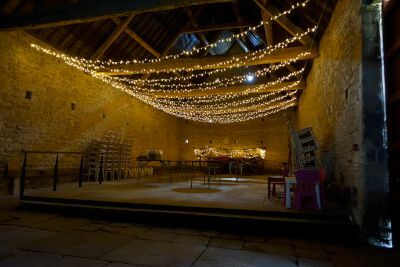 Here's a small collection of photos showing a really effective, complete lighting scheme at Cogges Manor Farm including ... deep breath ... fairy lights, drapes, Edison bulbs, festoon lights, uplighting, mirror ball, disco lights and bunting. Phew! The larger Wheat Barn was treated as two separate areas with a dining area at one end and a dance floor at the other. 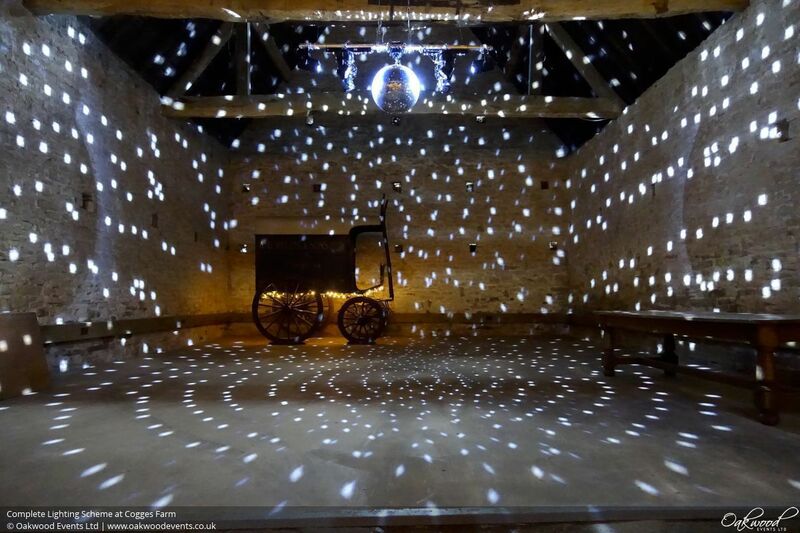 We installed a widthways fairy light canopy over the dining area plus extra fairy lights adorning the gorgeous cart. Suspended above the dance floor was a mirror ball with disco lights plus yet more fairy lights on the second vintage cart. 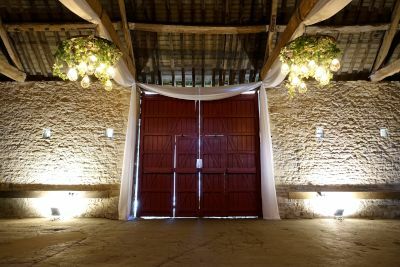 The smaller Barley Barn was to be used for the wedding ceremony and was decorated with fabric drapes to frame the ceremony area, plus two large Edison bulb and greenery chandeliers and warm white uplighting. 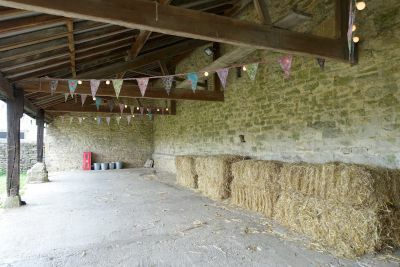 To make sure that the outdoor space could be used after dark, the covered lean-to area was lit with warm white festoon lights and decorated with vintage floral bunting. We will write you a review when we stop to breathe. 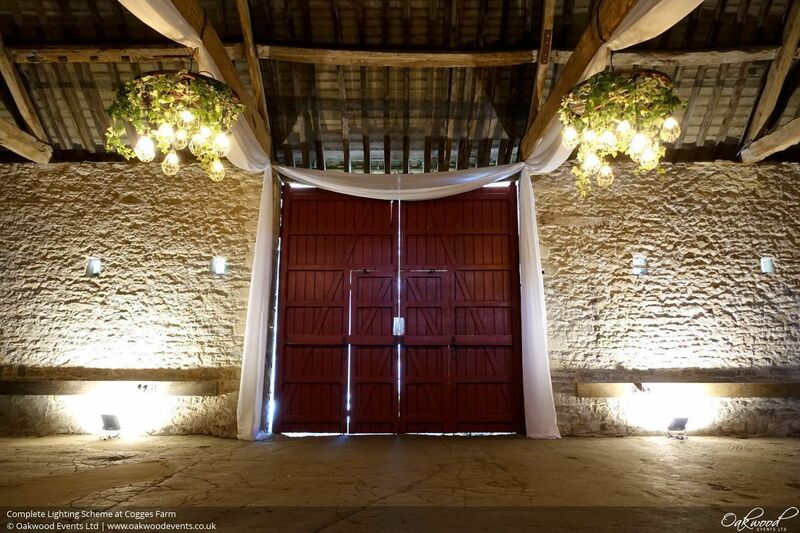 Just wanted to say quickly that the barns looked so beautiful with the lighting so great big thankyou to you and Steve. 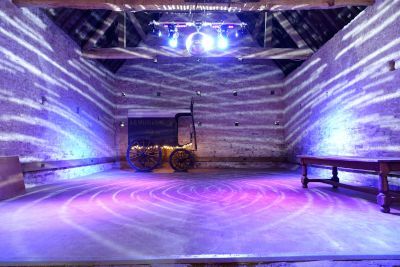 In fact I bumped into another couple booking Cogges for next year when I was clearing up and Cogges obviously recommended you, my cooing about your service I think has sealed the deal. 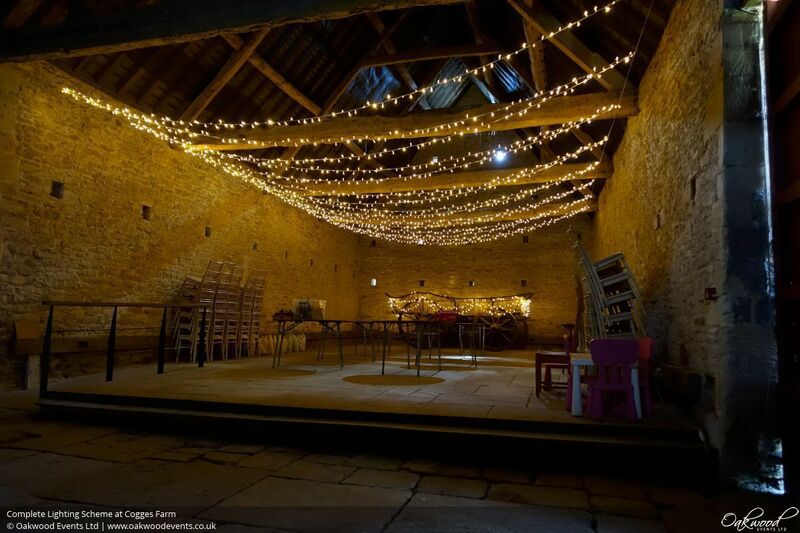 If you're considering lighting for a wedding at Cogges, why not get in touch with us to request a brochure?